It is the end of April, 1945 in a small village in eastern Germany. The front is coming closer and ten-year-old Fritz knows that the Soviet Army’s invasion of his family’s home can be only a few days away. Grandpa Karl, a Nazi sympathizer, takes Fritz into the forest that surrounds the family farm to show him a secret. Under a tall pine tree, Grandpa Karl has dug a pit and covered it with branches.The hole is to hide Fritz’s sister, mother, and grandmother when the Russians invade their village. Grandpa Karl is convinced that he and Fritz will defend to the death the Friedrich family. But when the Russian soldiers arrive, Fritz, his sister, and his mother find themselves alone. They look to Lech, a Polish farmhand, for help, but new communist policies force them off their farm and into the role of refugees. Separated from his home and eventually his family, Fritz has to find his own way in a crumbling world. 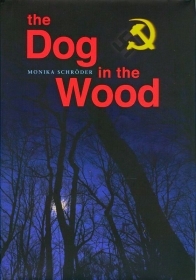 The Dog in the Wood tells a dramatic story of loss and survival in a changing Germany at the end of World War II. Front Street ©2009, ISBN-13: 978-1-59078-7014, ages 11-14, grades 5-8. Learn more about my other books, Saraswati's Way and My Brother's Shadow.